Dubai is a tourist’s paradise and anyone visiting Dubai must have a hot air balloon trip as it is the best flying adventure in Dubai. Check out the Balloon Air Tour that allows you to enjoy the bird view of Dubai city. Check hot air Balloon ride cheapest packages details with discounts for 2019-2020. 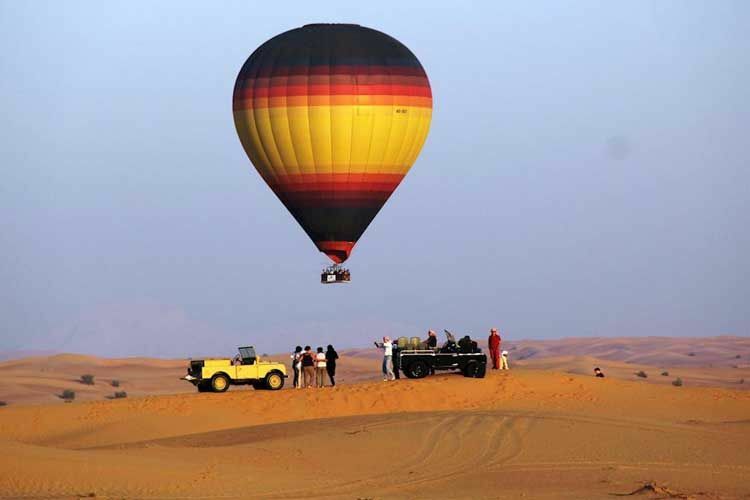 The hot air balloon ride is an excellent adventure while visiting the desert of Dubai. To have a thrilling experience in a hot air balloon, you should always book a trip early in the morning as this is a very popular trip in Dubai. Moreover an early morning hot air balloon trip will also help you to have great view of the sunrise and the atmosphere will also be comfortable. Excellent sky view of the camels, sand dunes of the desert and the Hajar Mountains makes this hot air balloon trip in Dubai much more desirable among the tourists. Children of 6-12 years can go for this hot air balloon ride. The duration of a hot air balloon trip is 1-2 hours and takes place between Dubai and Hatta. Proper information regarding the safety issues are provided by the trained people to the tourists. During the months of June, July and August this hot air balloon trip in Dubai is not available. After the trip ends, the tourists are given water, cold drinks as well as snacks. Thus while visiting Dubai one should always take a hot air balloon trip through the desert of Dubai.